Before the Allies landed on the beaches of Normandy in June 1944, their aerial reconnaissance discovered signs of German defenses on the Îles St. Marcouf. From these two coastal islands, German artillery could bombard the 4th US Infantry Division and repulse a crucial thrust of Operation Overlord. With the fate of the war on the line, the 4th Mechanized Cavalry Group navigated the islands' minefields and reported no trace of German soldiers. Their rapid and accurate intelligence gave the Allies the necessary time and concentration of forces for the D-Day invasion to succeed. 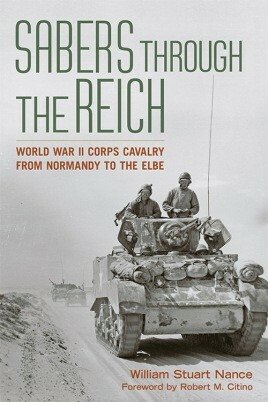 In Sabers through the Reich, William Stuart Nance provides the first comprehensive operational history of American corps cavalry in the European Theater of Operations (ETO) during World War II. The corps cavalry had a substantive and direct impact on Allied success in almost every campaign, serving as offensive guards for armies across Europe and conducting reconnaissance, economy of force, and security missions, as well as prisoner of war rescues. From D-Day and Operation Cobra to the Battle of the Bulge and the drive to the Rhine, these groups had the mobility, flexibility, and firepower to move quickly across the battlefield, enabling them to aid communications and intelligence gathering and reducing the Clausewitzian friction of war.